Acknowledged all over the world as Cyprus’ most important annual classical music event, the International Pharos Chamber Music Festival is also recognised as one of Europe’s preeminent music festivals, having gained an unequalled reputation for the quality of its concerts as well as its enchanting atmosphere and settings. Inaugurated 18 years ago, the Pharos Festival was the first festival of chamber music to be established in Cyprus and it has sIneto far attracted numerous of the world’s finest and most celebrated musicians, while it has garnered thousands of enthusiastic music lovers from all over the world, who visit the island especially to be part of this exceptionally uplifting music experience. The International Pharos Chamber Music Festival also maintains a strong tradition of community service, having made chamber music more accessible to the general public and giving the unique opportunity to students of public schools, as well as young instrumentalists from all over the world, to benefit through its educational activities at absolutely no cost! Organised between 31 May and 6 June 2018, the 18th International Pharos Chamber Music Festival welcomes to Cyprus some of the most remarkable artists on the international music scene, for an extensive week of music-making. 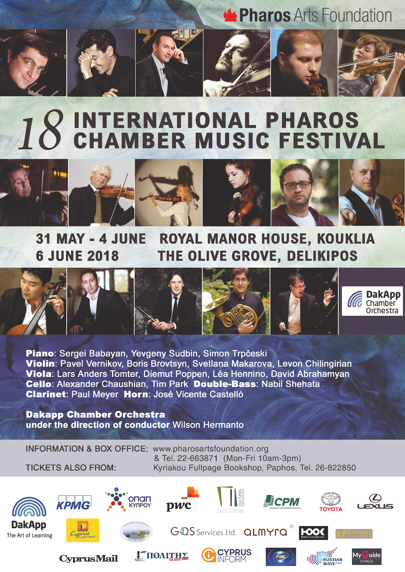 The Festival will open its doors at the Royal Manor House in Kouklia – one of the finest surviving monuments of Frankish architecture in Cyprus and a UNESCO World Heritage site – for five consecutive concerts (31 May – 4 June) with 16 internationally renowned soloists joining forces in an unparalleled programme of chamber music. The Festival will host, amongst others, Sergei Babayan – one of the most notable names of the great Russian piano school and winner of such prestigious competitions as the Cleveland, the Hamamatsu and the Busoni piano competitions; the sensational Yevgeny Sudbin, hailed by The Telegraph as ‘potentially one of the greatest pianists of the 21st century’; the extraordinarily compelling and Royal Philharmonic Society award winner, pianist Simon Trpčeski; the brilliant student of David Oistrach and Semyon Snitkowsky, Pavel Vernikov, who has evolved into one of the finest violin virtuosos of our times; the remarkable “Giant of the Nordic Viola” – Lars Anders Tomter and Paul Meyer, who is unanimously recognised as one of the world’s most outstanding clarinettists. Thursday 31 May – Monday 4 June @ Royal Manor House, Kouklia: Five chamber concerts with some of the world’s most renowned soloists in an exciting and wide-ranging programme.